Chemical Injection System, Virtual Terminal Console For Top Air Premier Series T-Tank Sprayers - Unverferth Mfg. 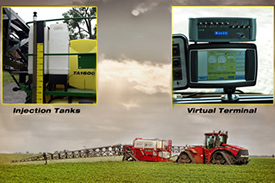 Unverferth Manufacturing Company, Inc., announces the availability of a chemical injection system and a virtual terminal console for tractors without ISO systems for the Top Air® Premier series of T-Tank sprayers. With these additions and the available steerable hitch option, Top Air models TA1200, TA1600 and TA2400, with 1200, 1600 and 2400 gallon capacities respectively, can now be equipped with all the comparable features and benefits of more costly self-propelled sprayers. With the Top Air direct chemical injection system, the sprayer’s main tank is loaded only with clean water and the chemical is contained in single 85-gallon or dual 24-gallon tanks, depending on sprayer model and capacity. The concentrated chemical is then accurately injected into the spraying system and mixed with the water just prior to being sprayed out of the boom. Compared to conventional sprayer systems, injection sprayer systems can reduce applicator exposure to chemicals during the mixing and loading process. Handling of unused chemical is also less of a problem since it’s undiluted and can be returned to the original container for later use or disposal. The operator can also quickly change from one chemical to another without having to clean and/or rinse the main tank. Chemical application rates are adjustable by regulating the concentration injected into the boom, allowing the Top Air Premier Series of pull-type sprayers to match the variable-rate capability of self-propelled sprayers for applying varying amounts of chemicals at different locations within a field for site-specific crop management. Growers can also utilize the injection tank to carry another chemical on the sprayer, in addition to a tank mix, for application to particularly troublesome field areas. The optional virtual terminal console is mounted in tractors without ISO capability. This “plug-n-spray” feature allows for quick setup and easy touch screen spraying operation from the comfort of the cab. The Top Air steerable hitch option minimizes the amount of run-down crop by creating just one set of tracks on headlands and turns. The steerable hitch option works with ISO-equipped tractors, the Top Air virtual terminal console, 4400 or stand-alone controllers. In addition, Top Air Premier Series T-Tank sprayers feature independent rubber-cushioned axle suspension for a smoother ride and extended tank life and tri-folding booms with stainless steel plumbing and hardware for added durability. They’re also available in a variety of undercarriage options of singles, duals or tracks to meet grower needs. See your nearest Top Air dealer today for complete details on the complete line of Top Air Premier T-Tank Sprayers. Or, visit the Top Air website at www.topairequip.com or call 1-800-322-6301.